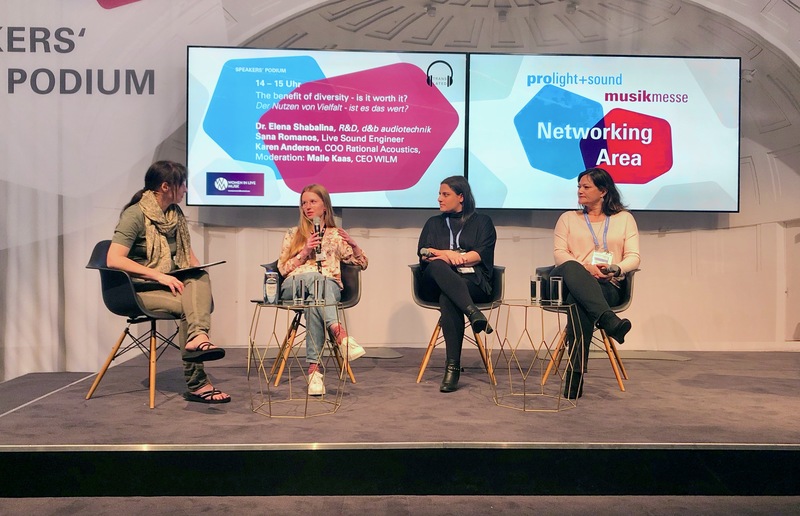 Women in Live Music held a panel discussion during the Prolight + Sound 2019 trade show. The topic for the panel covered diversity in the live music field and featured three distinguished panelists: Karen Anderson (COO and founding member of Rational Acoustics (SMAART)), Dr. Elena Shabalina (d&b audiotechnik R&D) and Sana Romanos (freelance sound engineer from the Middle East). The panel was moderated by WILM’s own CEO – Malle Kaas. With less than 10% women working as crew members in the live music industry – and with even less women represented in the technical field, WILM wanted to know if diversity is doing any progress, and asked the three women in the panel – all working in influential positions within the technical field, about their point of view on diversity. “What is your impression of the existing diversity”? -Sana: It’s a very shy presence for females in general, but i think it is changing. 10 or 20 years ago we barely had any women working in the field and now it is changing bit by bit. We are going in the right direction, but it is still a long way to go. This is why organisations like WILM come in to support and encourage women. -Karen: It is trending in the right direction, but we need to remember we are just one generation away from when women were just expected to be wives and raise children. -Elena: Diversity is very different from country to country. Germany is very different to Russia in terms of how many female engineers there are for example. There are a lot more in Germany for instance. -Sana: A whole cultural shift, societal values are changing, women are being empowered and more active in society. -Karen: Organisations like WILM and efforts to get women at a younger age to know what opportunities are out there, through educational programs and summer camps. Reaching out and exposing these roles to a younger age group makes it more normal to join. Malle: “In WILM we are not aiming for a 50/50 quota between men and women, we just want to see more balance. However, with the massive initiatives we see at the moment everywhere, we need to watch out that it doesn’t tip the other way. Because that wouldn’t be equal either, right? Sana: I think the purpose of any discussion about diversity is not to eliminate men. At the end of the day, it’s the job I am getting done that matters. But in the sense of diversity and the discussion we are having now, it’s because we know that there are women shying away who are capable of doing the job. We don’t encourage because we want to overpower or eliminate men, we encourage because some women have the potential, but they are shying away because they think it is not possible. I would love to be an inspiration for other women to know that they can make it in live sound. It can happen if you’re a woman, even if you’re a woman from the Middle East. It’s not about going in the other direction and eliminating all men. The bottom line is gender does not matter. -Karen: I agree. Diversity for diversity’s sake is just as harmful as a lack of diversity. I think the worst thing you can probably do for the advancement of women is to put them in positions just for the sake of hiring women. If you put an under-qualified woman on a gig or on a tour, and they do a bad job, anyone who is holding these kinds of biases are going to have them reinforced. Never hire just for diversity’s sake, this is an incredibly results-oriented industry and respect in this industry is earned by good results. I actually think strangely it’s a pretty accepting industry if you are good at your job. Sometimes women have to work a little bit harder, but mostly it doesn’t matter as long as you get the job done. -Elena: Equilibrium in society is changing and gender balance is changing in a lot of different fields. I can imagine that the new balance point cannot be found without going over the top and back again. So i think that we should be patient with each other until this is reached. -Sana: I think women in general tend to shy away from any technical fields, and even more from live sound because it is so demanding physically and mentally. It’s not because they don’t have the potential of doing it. It’s because they are scared, intimidated and they don’t have enough inspiration to look up to. Whether you are a man or woman you might get to a point where you have a breakdown or burn-out so I think that is scary for women especially. -Elena: If a girl decides to go into a male-dominated field, she’s not only facing the external difficulties like not being taken seriously or being made fun of, but she also carries the heavy weight of self-doubt induced by feeling totally out of place, like they don’t belong in these roles. -Elena: I think a safe learning environment is an extremely important thing because the problems start early at school or university. When you hear things repeated to you ever since you’re 18, such as ‘women aren’t naturally technical’ you start believing it and unfortunately very few women make it through this. -Karen: From an employer’s point of view, I think we have to challenge our own hidden preconceived notions. Without thinking about it I assumed it would be a guy taking a tech support job we had to offer one time. And then it ended up being a woman and she is amazing. So sometimes you hold internal biases you didn’t even know you had. – Elena: Definitely a healthier working environment. Just to be around other women. I once worked 6 months without seeing or talking to other women. It was very disturbing not to have ‘one of your kind’ to identify with. Just working with one gender affects your behaviour and can be confusing. -Karen: Diversity contributes to advances in technology, just by the sheer nature of having different people working on something, who all have their own perspectives and solutions. A diverse gender, age group and even having people from different regions spurs innovation. -Sana: With a support system. A supportive community, where you can turn to if you’re in doubt. Mentorship by WILM. Support and inspiration is the best way to sustain. -Karen: The rise of social media is very important too.Before, you felt very isolated if 99 percent of your colleagues are men. You didn’t know there were others like you, so now the ability to connect with other women is by default going to keep more woman in the show. -Elena: I think support from male colleagues is essential and it doesn’t have to be much, but just having validation is important. The acknowledgement from men that something might not be right, makes the environment is much safer. It doesn’t mean that men have push women or help them. Just a simple acknowledgement that there is a problem is already extremely helpful. About Women In Live Music: WILM is a European community that focuses on increasing the number of women in live music – meaning those working behind the stage, such as technicians, tour managers etc. WILM organises workshops and meet-up’s all across Europe, where women can connect and exchange knowledge.